By Sheil Kapadia·	 7/1/2014, 1:45 p.m. If you missed the look at the offense, click here. Defensive line: The depth chart shows the Eagles in their base 3-4 alignment. The starters are set up front: Cedric Thornton, Bennie Logan and Fletcher Cox. But beyond that, there are some jobs to be won. Vinny Curry’s playing time increased last year, and he’s put on weight. He projects to be a situational pass-rusher and backup defensive end. The backup nose tackle job is up for grabs this summer. Damion Square played there last year, and Beau Allen was selected in the seventh round back in May. If I had to place a wager right now, I’d put my money on Allen to get the nod, but because it’s impossible to evaluate defensive linemen without pads, I placed Square on the second team here. Joe Kruger and Taylor Hart could both very well make the roster. When Hart was drafted, Chip Kelly noted that he’d already be ahead of some of the current guys in terms of technique and understanding the defense. He could be in line to play base defensive end with the second team if he has a solid summer. It’s unclear how the team views Kruger. He basically red-shirted in 2013 and is now aiming for a rotational spot. He probably brings more pass-rush than Hart. If you’re looking at overall roster spots, the Eagles could very well keep seven defensive linemen on the 53-man. Outside linebacker: Barring something unforeseen, Connor Barwin and Trent Cole will go into the season as the starters. I gave rookie Marcus Smith II the benefit of the doubt and placed him with the second team here, even though he was practicing with the threes all spring. Once the season starts, I fully expect the first-round pick to be part of the rotation. I really don’t know what to make of Brandon Graham. Maybe he continues as a rotational player. Or maybe he’s off the team. Everything’s in play. Those within the organization have had a lot of good things to say about Travis Long. And the team signed Bryan Braman in the offseason to provide a boost on special teams. Inside linebacker: The starters are in place with DeMeco Ryans and Mychal Kendricks. Billy Davis said the team will play Ryans fewer snaps this season. The player most likely to spell him is Najee Goode. He and Jason Phillips practiced with the twos during the spring. Jake Knott faces a four-game suspension to start the season. Emmanuel Acho will likely have to prove himself on special teams and beat out Phillips to earn a roster spot. You’ll notice I don’t have Casey Matthews listed. He switched from inside linebacker to outside last season. I’m not sure there’s a place for him on the roster, but I could be wrong. Cornerback: The biggest move the Eagles made here during the offseason was signing Nolan Carroll II. He had an excellent spring and could push for a starting job. The guess here is that Carroll is more likely to push Bradley Fletcher than Cary Williams. It seems pretty clear that Brandon Boykin isn’t going to get a shot to start on the outside, no matter how well he plays. He’ll continue to get about 50 percent of the snaps as the Eagles’ nickel. Jaylen Watkins didn’t show much in the spring, but that’s expected for a rookie. Guys like Roc Carmichael and Curtis Marsh will be fighting for roster spots. 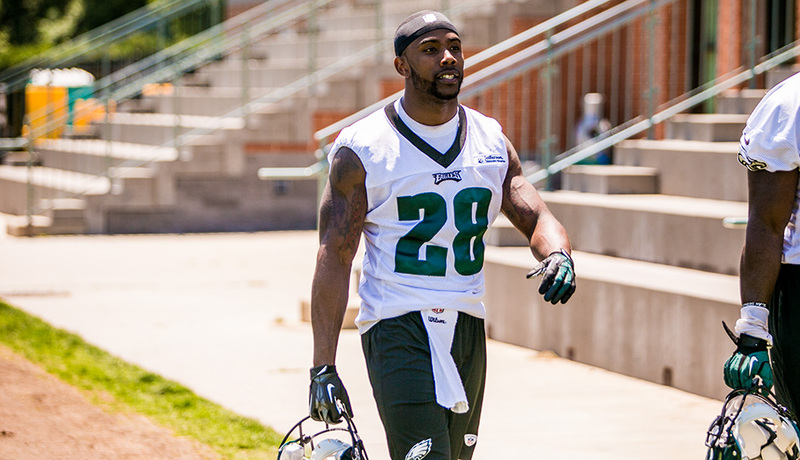 Safety: The coaching staff has made one thing clear: Nothing is going to be handed to Earl Wolff. If the second-year player wants to get on the field, he’ll have to earn it. Malcolm Jenkins is one starter, and Nate Allen is penciled in as the other. Rookie Ed Reynolds has to play catch-up after missing most of the spring. And Chris Maragos’ value figures to come mostly on special teams.